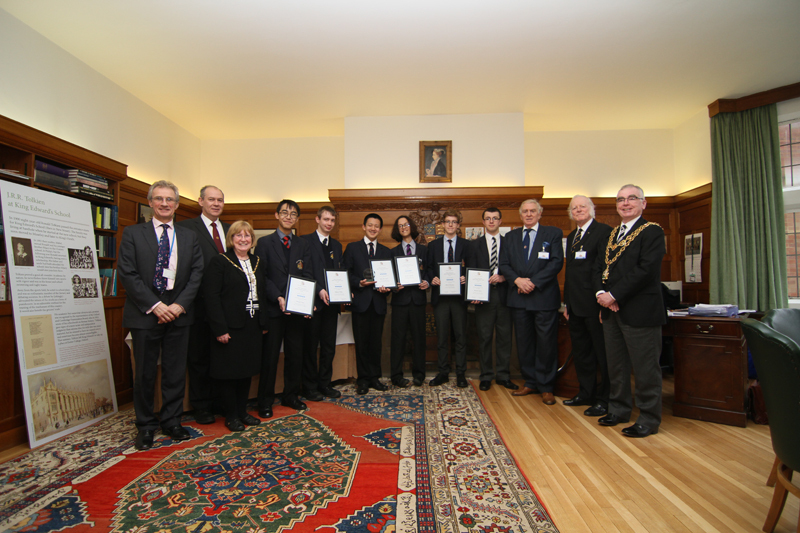 The Lord Mayor of Birmingham presented the Shaun Lyttle trophy, the prize for the Lord Mayor’s Annual Sixth Form Mega-Quiz, to a team of boys from King Edward’s School, Birmingham on Thursday, 6 February 2014. The boys in the winning team, named the KEStrels, were presented with a trophy and each given a certificate by the Lord Mayor, Councillor Mike Leddy, before enjoying an informal chat over tea and cake. 50 teams from across the West Midlands took part in the Mega-Quiz, which was held at the University of Birmingham before Christmas. The teams competed in 10 rounds of questions in the quiz hosted by celebrity quiz-master, Mark ‘The Beast’ Labbett from ITV’s The Chase. John Claughton, Chief Master of King Edward’s School, said: “It is a great honour to welcome the Lord Mayor to the school to present the prize for this prestigious competition. The KEStrels team is made up of Yanbo Yin (captain), Clement Chan, Jonathan Gorard, Harrison Green and Patrick Wernham in Year 12 and Richard Miller in Year 13.